Through Her extraordinary acts of love and self-sacrifice, Amma has endeared Herself to millions. Through Her loving embrace and charitable activities, She is healing the heart of the world, rekindling love and mutual respect, and awakening people to their fundamental Oneness. Love, compassion, humility and tolerance—under the pressures of modern life, these qualities have all but disappeared. Tenderly caressing everyone who comes to Her, holding them close to Her heart in a loving embrace, Amma shares Her boundless love with all—be they young or old, sick or healthy, rich or poor. Amma’s compassion crosses all barriers of nationality, race, caste and religion. She has initiated and inspired a vast network of charitable activities, which is drawing attention throughout the world. Through Her extraordinary acts of love and self-sacrifice, Amma has endeared Herself to millions. Through Her loving embrace and charitable activities, Sri Mata Amritanandamayi (Amma, or Mother) is healing the heart of the world, rekindling love and mutual respect, and awakening people to their fundamental Oneness. At the root of these services lies Amma’s teaching that the Divine exists in everything—in every person, plant and animal. Perceiving this unity is the essence of spirituality and the means by which to end all suffering. It is through this simple, yet powerful, message that Amma is transforming our world, one embrace at a time. 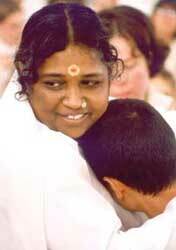 In the past 30 years, Amma has physically embraced more than 31 million people. Amma’s teachings are universal. Whenever She is asked about Her religion, She replies that Her religion is Love. She does not ask anyone to believe in God or to change their faith, but only to inquire into their own real nature and to believe in themselves. Amma was born in a poor fishing village in Kerala, Southern India, in 1953. Even as a small child, it was clear that She was unique. Without any prompting, She was deeply spiritual, and the intensity of Her compassion was remarkable. But because She was different, She was misunderstood and mistreated. She had a very difficult childhood and suffered a great deal. From an early age, She spent most of her time doing household chores. As part of Her work, She had to roam the local villages, gathering grass and asking for fodder for the cows. At times like these, She saw how some people were starving, while others had more than enough. She saw that many people were sick and suffering, unable to afford a single painkiller. And She noticed that many of the elderly were neglected. The pain of others was unbearable to Her. Though just a child, She began to contemplate the nature of suffering. Why do people suffer? What is the cause? And so powerfully did She feel the presence of God within Her that She wanted to reach out and comfort and uplift those around Her. In many ways, it was then that Amma’s mission began. She would share Her food with the starving, and She would bathe and clothe the neglected. She was punished when She gave away Her family’s food and belongings to the poor, but Her compassion was such that nothing could deter Her. People began noticing that there was something extraordinary about Her, that She was completely selfless, that She was dedicating every moment of Her life to care for others, and that She radiated a boundless love towards everyone. By the time Amma was in her early twenties, the Universal Motherhood that was awakened within Her made Her spontaneously embrace everyone who came to Her, experiencing each one as Her very own child. Hundreds of people were coming each day to spend a few moments in Her arms. Amma would listen to their sorrows and console them. She also began teaching them about the true purpose of life. In 1979, Amma’s first monastic disciples came to reside permanently by Her side. It was they who named Her Mata Amritanandamayi (Mother of Immortal Bliss). As more and more people began coming to Amma for spiritual guidance, an ashram was founded. Thus in 1981, the construction of a few humble huts marked the beginning of the Mata Amritanandamayi Math. But Amma’s children were not in India alone. She felt their longing coming from all over the globe. In 1987, in response to their invitations, Amma embarked on Her first world tour. Today Amma spends most of the year travelling throughout India and the world, where people flock to see Her and are inspired by Her example of pure love and compassion. The Ashram is now home to more than 2,300 disciples and devotees. And thousands visit every day from all corners of the world. Inspired by Amma’s example, ashramites and visitors alike dedicate themselves to serving the world. Through Amma’s vast network of charitable projects, they build homes for the homeless, give pensions to the destitute and provide medical care for the sick. Countless people all over the world are contributing to this loving endeavor. Visit amritapuri.org, the homepage of Amma, to learn more about Amma’s life, mission and teachings.